Best tank size for Molly Fish? Molly fish, commonly known as mollies are some of the most beautiful aquarium fish one can keep. There are several breeds in the market such as black molly, the balloon belly molly, and the Dalmatian molly among others. Regardless of their breeds, the care issues such as the tank size requirements and the feeding are basically the same. However, when choosing the right tank size for molly fish, the size of some varieties can compel one to go for a smaller or a larger tank size. How many Molly Fish my tank can accomodate? When choosing a tank for mollies one needs to consider several things. Firstly, the number of mollies to be put into one tank. The best number of mollies that can survive comfortably in one tank ought to be less than 10 or 1 in every 5 gallon. However, there can be more mollies in case the tank is large enough and the variety of mollies to be kept is the short-finned molly whose maximum size is relatively small. One should maintain strict rations of stocking mollies into any size of tank. A ratio of 2 females for each male is recommended in order to control the breeding and the competition for space, food and oxygen requirements in the tank. Secondly the size and breed of mollies to be placed in a given tank should also be a consideration in choosing the right tank. The short-finned molly is relatively small and therefore undemanding in tank size. This variety grows to a maximum size of 4 inches (10 cm) and it can be housed comfortably in a 10-gallon tank. However, one can provide them with a 29 gallon tank, if they really want to have them thrive. 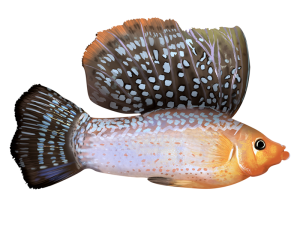 The sailfin mollies which grow to a maximum size of 6 inches (15 cm) require a tank with a minimum capacity of 29 gallons (110 liters). The larger the tank, the more stable is the environment for the fish since mollies are prone to issues that come with sudden fluctuations in water quality- an issue common in smaller tanks. The 29-gallon tank accommodates only a small group of mollies and larger groups need larger tanks of about 45 gallons (170 liters). Larger tanks provide appropriate water conditions as the population of the mollies increase. The black molly is a highly suited for community tanks because it is relatively peaceful. Thirdly, the tank size should also be reasonably big in order to accommodate plants and the lifestyle of the mollies. Adult mollies appreciate a heavily planted tank. Some of the plants recommended for growth are java fern, anubias and vallisneria. Alternatively, one can have a thick algae mat on the floor of the tank. On one corner of the tank, some floating plants are necessary in order to promote the rearing of mollies outside the breeding tank. Moreover, some mollies are timid and they get bullied by the others and as such they need hiding places. Larger tanks are a good choice because they can accommodate plants and the fish while providing an almost natural habitat for the fish to thrive. The shape of the tank does not matter much as long as the tank is big enough to accommodate the mollies and their lifestyle. 1 per 2 gallons usually in 3s (mff). So abt 65 with llots of plants and decor, I would start with thrity though, because a newer tank might not be able to take that bio load. How many gallons would be needed for 3 mollies? How many gallons does one dalmation molly need? 5 is the minimum for even one but you can keep up to 3 in a 5 gal. I have a 7.5 gallon tank, can i have Mollies or is the tank too small? If yes, how many Mollies can i have? can i keep them healthy in that?? Yes, they will live up to 10 years in a 6-gallon tank! I have a 20-gallon long tank. How many mollies can I safely have in there so they can thrive? Could I get away by using a 10 gallon aquarium for a couple of months until I can afford a 30 gallon?